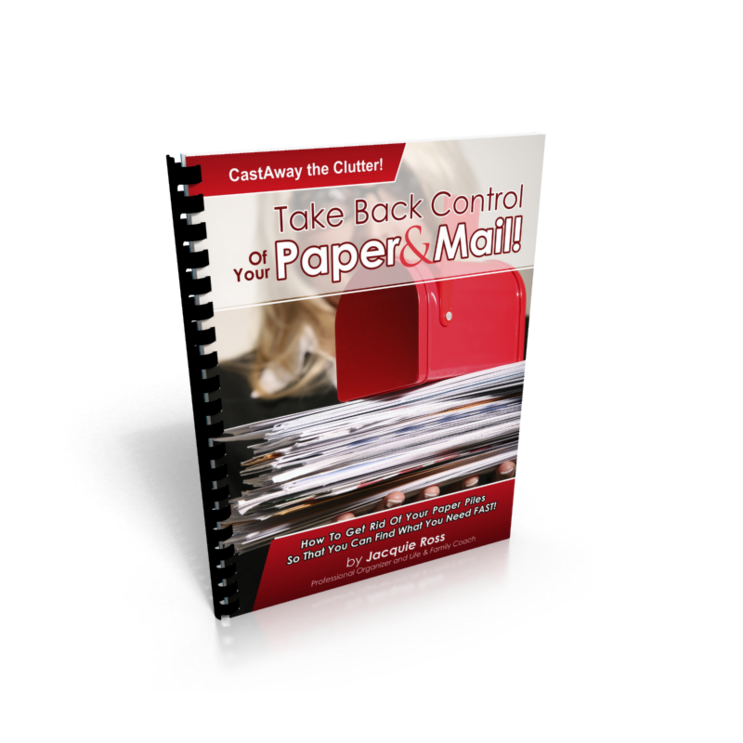 It's Time to Get those Paper Piles Under Control! 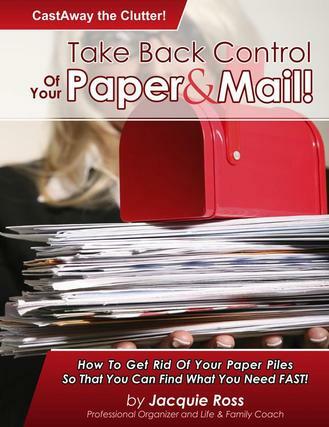 Take Back Control of Your Paper & Mail! A $22.00 Value! Yours today for only $12.97 and Receive a Bonus Subscription of my Timely Organizing Tips with more organizing tips for your home and office! How to organize your household bills so that you don't lose them or forget to pay them. 10 essential tools you should have on hand to efficiently handle your incoming mail. What you need to do to process the barrage of paper and mail you receive on a daily basis. Tips for creating a system to collect papers for taxes throughout the year. What to do with all of those pesky receipts! How to deal with magazines and catalogs so that they don’t clutter up your home. How to organize warranties and manuals so that you can find them when you need them. How to organize greeting cards. Filled with dozens of Paper Clutter and Mail Tacking Tips and Techniques PLUS Home Organization Tips and Product Ideas for Managing Your Paper and Mail! For about the cost of a box of hanging files and some basic office supplies, get your paper decluttering book today. Your box of hanging files are no good if you don't know what to do with them! This instantly downloadable e-book is 41 pages, and full of easy to apply, and easy to understand tips and techniques. Included are also colorful illustrations. Get your copy now, by clicking on the link to pay. We're not sure how long we'll be offering this at this low price! You can be assured of a secure transaction. Tired of all of the paper and piles of mail? Never seem to be able to stay on top of it? 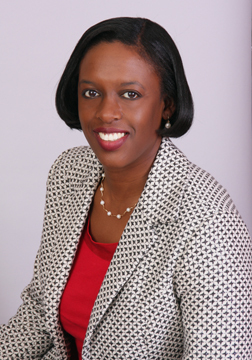 Are you a busy stay at home or working mom surrounded by paper clutter and don't know where to start? If you answered yes to any of the above, are you ready to learn some paper management tips and strategies to help you to finally clear those paper piles, get organized and find more time for the things that matter to you? There is a way to take back control of your paper and mail, and professional organizers like me apply these paper control techniques everyday. Wouldn't it be nice to actually shop for a specific organization product because you have a plan? Instead of just buying products you think will fix an existing problem? Educating yourself on decluttering and organizing techniques is the first step to getting organized. So, before you buy another organizing product to control your paper clutter, buy this book. Don't procrastinate! Learn how to control your paper clutter from one of the best professional organizers! Get your copy now and eliminate those paper piles! This is the NEW AND IMPROVED 2012 Edition with several more chapters than the first edition. Get rid of your paper piles once and for all. Not for $22.00, 18.00 or even 15.00. Buy your copy TODAY and receive it TODAY via email for ONLY $12.97!